After a decade in Dubai the QE2 hotel is finally open! See qe2.com for more information. The ship has entered dry dock for final preparations to open as a hotel. 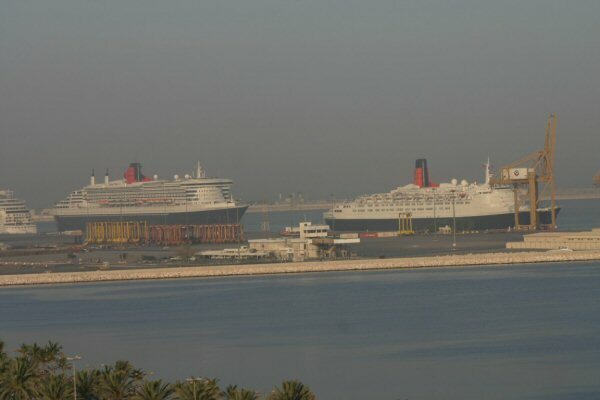 Since arrival in Dubai one year ago there has been very little progress with QE2's conversion to a hotel. There was even speculation about a potential move to Cape Town. 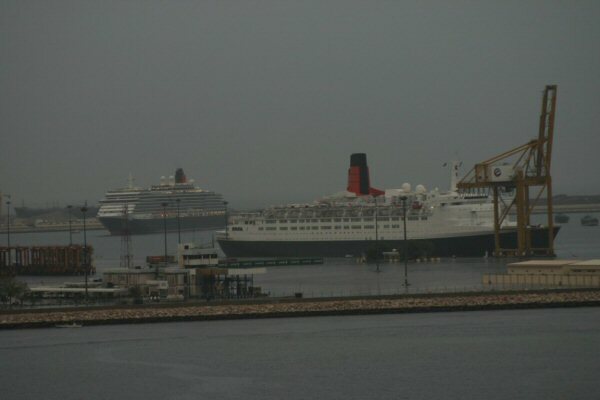 During March QE2 was visited in Dubai by the Cunard ships Queen Mary 2 and Queen Victoria. QM2 called on the 20th and QV on the 28th. 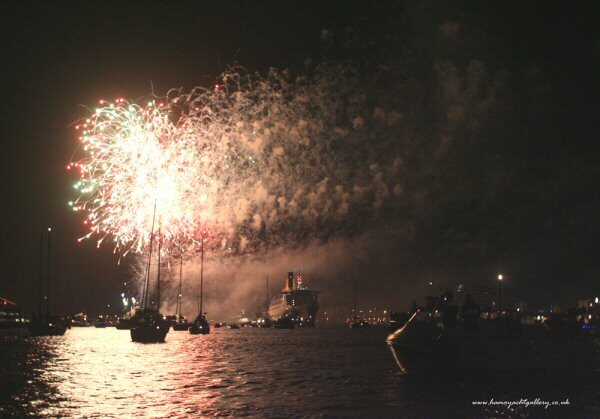 Photographs taken from the Hyatt Galleria Residence by former US Naval Officer. 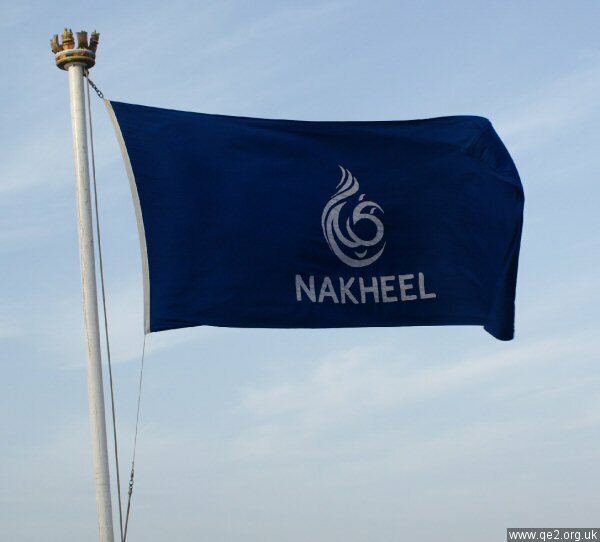 The sale formalities were completed and at 1405 local time Captain McNaught made his final entry in the Official Log Book formally handing over ownership of the vessel to Nakheel Hotels, a division of Dubai World. This historic log entry signaled the end of the Queen Elizabeth 2's 40 distinguished years of service with Cunard Line. The command of the QE2 was taken over by Captain R W Warwick, previously Commodore of Cunard Line and the vessel is being managed by V.Ships Leisure based in Monacco. A subsidiary company, QE2 Enterprises, has been created to oversee the conversion of the ship. On completion, she will remain permanently moored at Palm Jumeriah alongside a custom made pier which is yet to be constructed. Since the ship arrived in Dubai an extensive cleaning programme of all public rooms, passenger and crew cabins has been underway. The revered Cunard Heritage Trail has been photographed and catalogued and some of the ship models have been restored in situ. Detailed plans of the conversion work have yet to be finalized. However, at the recent Middle East Seatrade Conference, the CEO of QE2 Enterprises revealed that conversion work will include the introduction of luxury hotel rooms, apartments, a West End style theatre and modern health spa. Apart from general refurbishment, certain areas will remain unchanged. Some of these include the bridge, captain's quarters and the Princess Grill. It is too soon to say when the QE2 will be ready to 'board' passengers again but the work is estimated to take 2 to 3 years to complete. Although the QE2 has ceased to be registered in the UK, the new owners have chosen to keep Southampton painted on the stern. 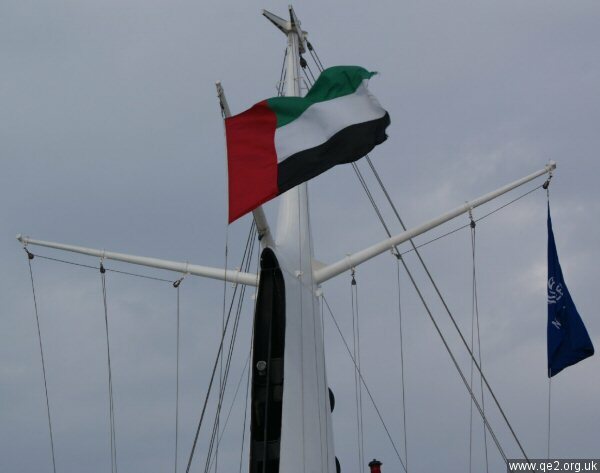 Because of this, the flag of the United Arab Emirates flies from the mainmast. Arrived and docked at Port Rashid, Dubai. Under the command of Captain Ian McNaught, QE2 put to sea on her final voyage from Southampton to Dubai calling at Lisbon, Gibraltar, Citavecchia, Naples, Valletta, Alexandria, Port Said and the Suez Canal enroute. The Queen made a personal visit to the QE2 which she launched on the Clyde in 1967. The Queen toured the vessel, meeting many crew members, some of whom have served on board since QE2 entered service in 1969 and others who went with the ship when she was requisitioned as a troop carrier in the Falklands Conflict. Later she attended a reception and lunch on board with 300 guests, including the former Prime Minister Baroness Thatcher. 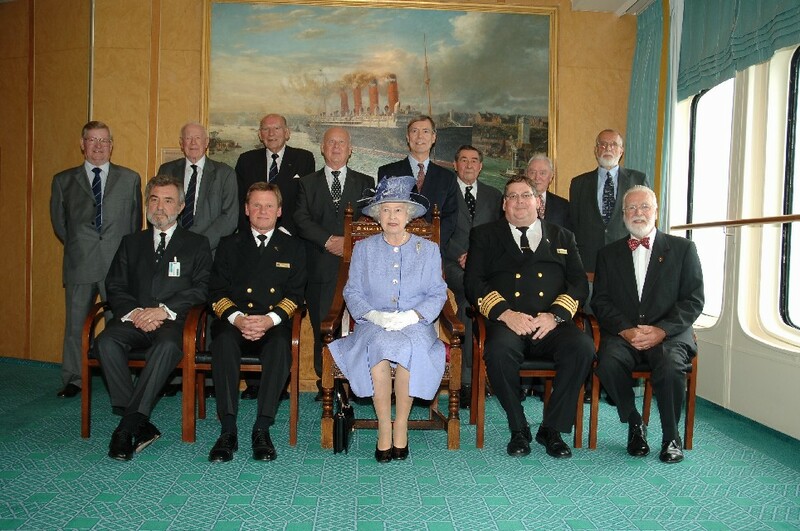 The event was attended by nine QE2 captains, past and present. The QE2 will be delivered to Dubai World in November 2008, where she will cease her role as an ocean-going passenger vessel and be refurbished and adapted for her new home. From 2009, the vessel will be berthed at a specially-constructed pier at The Palm Jumeirah, the world's largest man-made island, to create a luxury floating hotel, retail and entertainment destination. This is an independent QE2 web-site, and not associated with Cunard Line Ltd or the ships current owners.